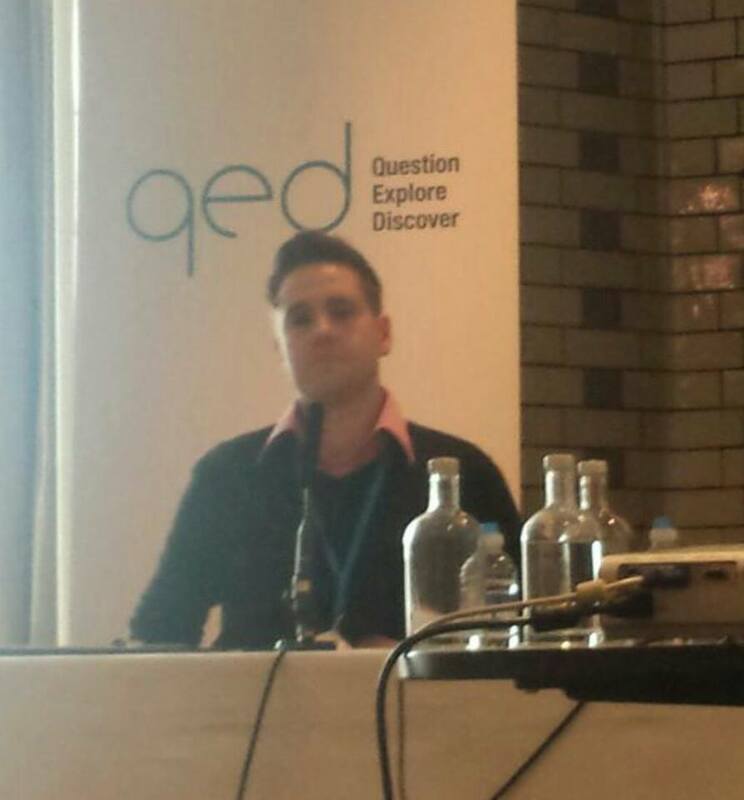 I had the pleasure of attending my first ever QEDcon this weekend in Manchester. The convention is a wonderful mix of interesting and often hilarious talks and panels on topics related to science & scepticism. As well as the fantastic speakers, there’s also an infectious, friendly vibe that permeates through the whole occasion thanks to the passion and good nature of the attendees. I thoroughly recommend taking a look at the guest speakers and seeking out their work, as well as coming along in 2016 if you can. 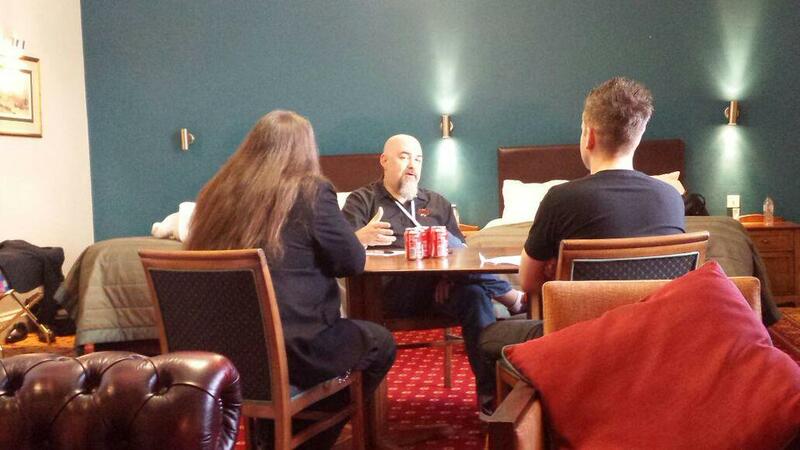 Two favourites of the sceptical movement, and thoroughly nice guys at that, Matt Dillahunty and Aron Ra were in attendance and I wasn’t going to pass up the opportunity to try get some sit-down time with them for The #GSPodcast. 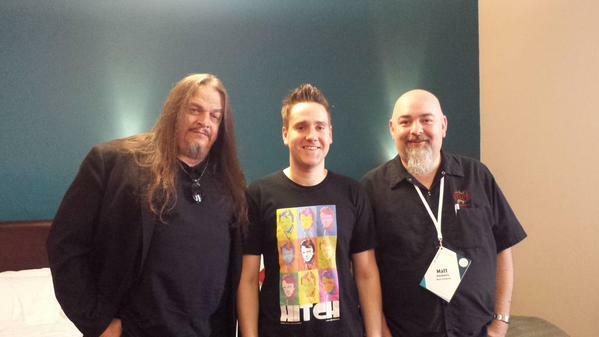 There’s a lot of demand, love and respect for these gentlemen at events like this (and rightly so! ), so getting some lengthy one on one time can be a challenge. In the meantime I made a game of covertly snapping Matt whenever I saw him. 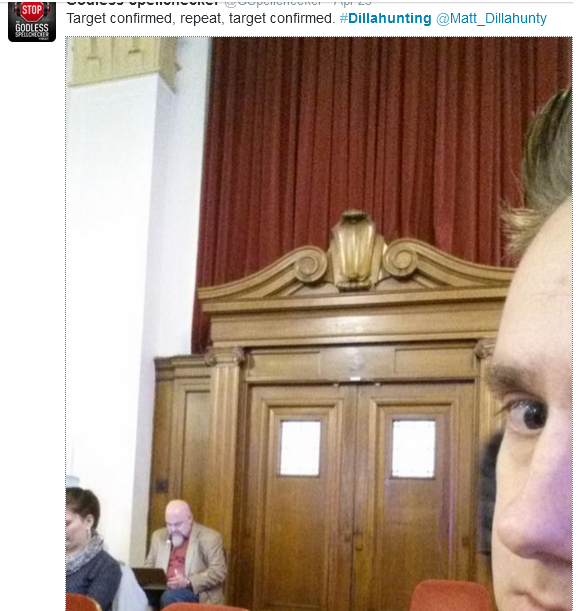 I call this sport ‘#Dillahunting’. I know for a fact I gloriously photo-bombed someone else’s photograph with him too. I hope that surfaces online at some point, and they didn’t mind too much. Sorry! Luckily, our schedules aligned on the Sunday afternoon and we sat down in my hotel suite to have a great discussion. Make sure you listen to it here. I hope I get to meet those two again some day. Awesome guys. Not only was I there in the capacity of excited attendee looking forward to meeting and learning from some much smarter people, but I was also fortunate to be asked to speak on my very first panel. 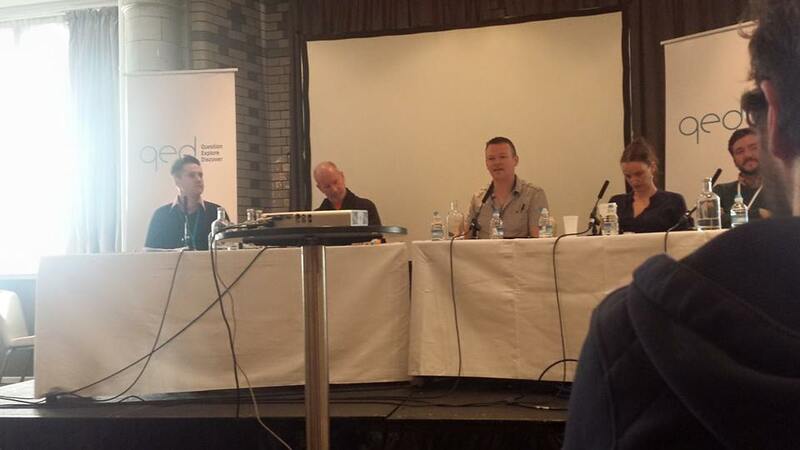 The panel was titled ‘How To Silence Those Who Disagree With You’. The title is intentionally tongue in cheek, with the goal of looking at the ways disingenuous people seek to shut down criticism, debate or ban the discussion of certain ideas. From ‘No platforming’, to gunning down cartoonists, to being suspended on Twitter. It was a varied affair! I was joined by Andrew Copson, Kate Smurthwaite and Paul Fitzgerald. I was a bit nervy to begin with (accidently mudding LGBT as “Gesbian and lay”, then immediately exclaiming “Jesus Christ!” at my error), but I generated a few laughs and on balance I think I mostly got away with it. It’s a possibility that it may end up online at some point, so I’ll be sure to share it if that’s the case. I took some time to mention how the ‘Report Abuse’ function on Twitter is being exploited in some cases in order to shut down genuine criticism & disagreement. When asked by moderator Geoff Whelan whether I had any idea who was responsible for using this tactic with me, I said it would be best not to name them, so referred to them as ‘Johammad Chansar’ instead. A lot of people laughed. Brilliant. I also made my dissatisfaction known with the expanding offense-culture which thrives via the exploitation of ‘Trigger Warnings’ & ‘safe spaces’ in Academic Institutions. I did this because I think these concepts are sometimes used to shut down debate too. This appeared to ruffle a few feathers. Good! This leads to discourse. I must stress I’m not anti-‘safe spaces’ or ‘trigger warnings’ when used as mere reasonable courtesies (as is their original purpose). And who wouldn’t want to create an environment where everyone can feel at a reasonable level of ease, particularly minorities who have a history of – and increased probability of – experiencing persecution (see Gesbians and Lays). Not to mention we should have empathy and consideration for peoples’ mental health concerns. My only worry is that these concepts are being exploited – their qualifying criteria made so broad as to encapsulate anything and everything, running the risk of including topics people simply just don’t want discussed or debated, rather than simply hoping for a ‘heads up’. As a result, I’ve noticed the language of trigger warnings and safe spaces used to justify successful attempts at ‘no platforming’, or to veto screenings of certain movies on campuses. Exploiting the worthy intentions of ‘Trigger Warnings’ and ‘Safe Spaces’ in this manner only serves to trivialise the legitimate concerns they were originally conceived for. If we can pre-warn someone of potentially distressing material, why not? But let’s not prohibit such material for everyone else as a result. This stifles learning and hinders the absolutely essential need to challenge minds by exposing them to uncomfortable truths and opposing viewpoints. Hearing things you don’t like or agree with is a vital component of education. If you feel there’s an unhelpul conflation being made between censorship and trigger warnings here, it may be best to vent your dissatisfaction towards those committed to forging that link by using them as a pretext to prevent discussion. Even though on the panel I reiterated that ‘safe spaces’ have worthy intentions, but are being exploited, maybe I could have emphasised that point more vigorously as to not to appear like it was a complete dismissal of them. I want to encourage empathy, but at the same time I want to criticise disingenuous attempts to co-opt it. 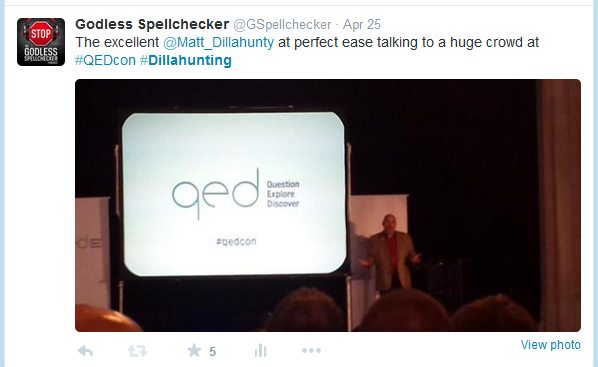 As a first-time speaker, I hope to improve my clarity with experience, should the opportunities present themselves. 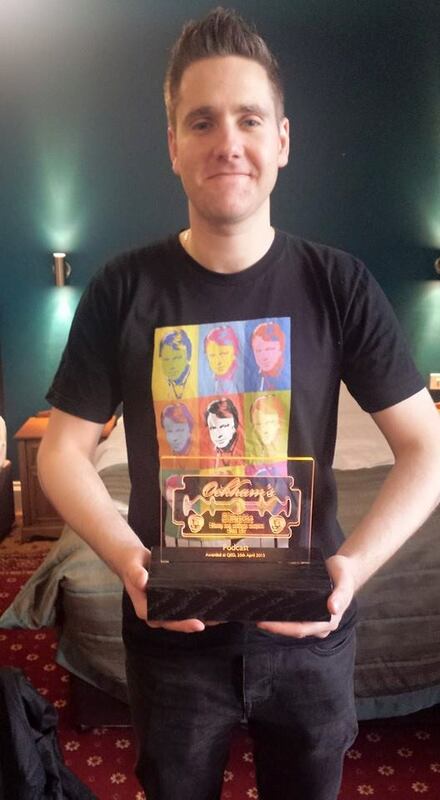 My podcast was also nominated for an award which it clearly had no chance of winning, but I was very pleased just to be nominated nonetheless. 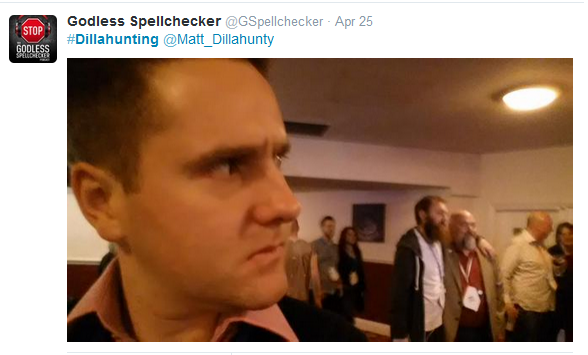 You can imagine my sweary response of disbelief however when they called out ‘Godless Spellchecker’ when announcing the winner. I was that convinced a walk up to the stage to collect an award wasn’t on the cards, that I took up a table right at the rear of the huge ceremony hall, initiating a lengthy and dazzled shuffle to the stage. I thanked my listeners and guests. I took a brief moment to remark how lucky I felt to live in a society where I could blog about whatever I wanted and could podcast about whatever I wanted – and how this required no real courage on my part. Some are not so fortunate however. With that in mind I dedicated the award to the courage of Raif Badawi, Avijit Roy and Washiqur Rahman. I won’t forget them, or their courage. 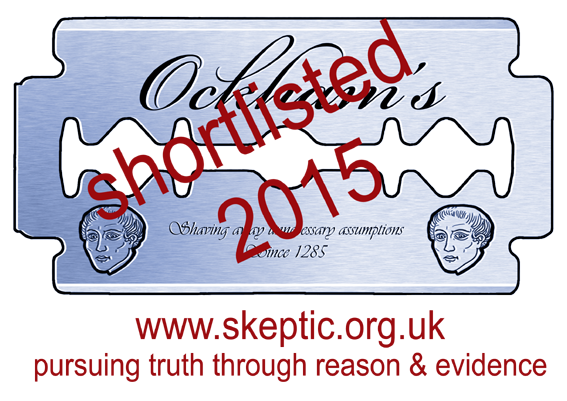 Thanks to The Skeptic Magazine for the incredibly fancy award. 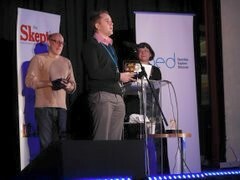 And thank you to all the organisers and volunteers at QEDcon. 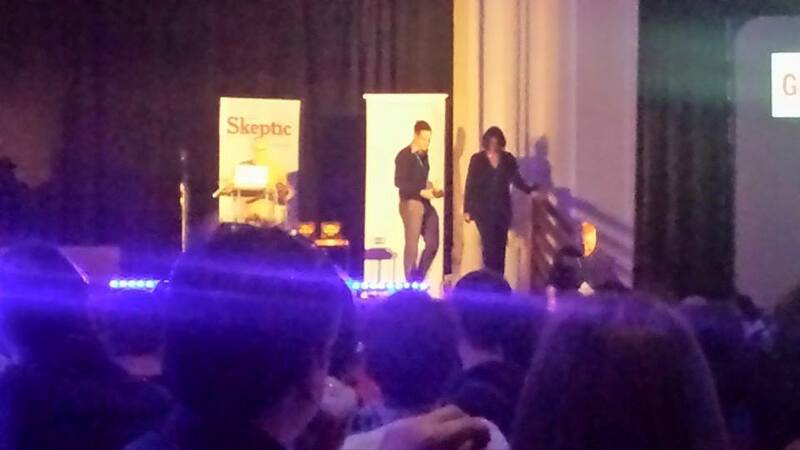 I loved my first QEDcon and hope to see many more. Especially, I want to thank all the people who came over and said hello to me. You were lovely. A Good Eggs tweet “I believe trigger warnings and safe spaces should be protected, because the rebound can be horrific”… exemplifies the problem with safe spaces, and trigger warnings. They implies that someone is going to say something so beyond the pale that the results could be horrific. Which can both drive people away from an event/speaker, and cause people to have unjustified negative preconceptions regarding the content of an event/speech.